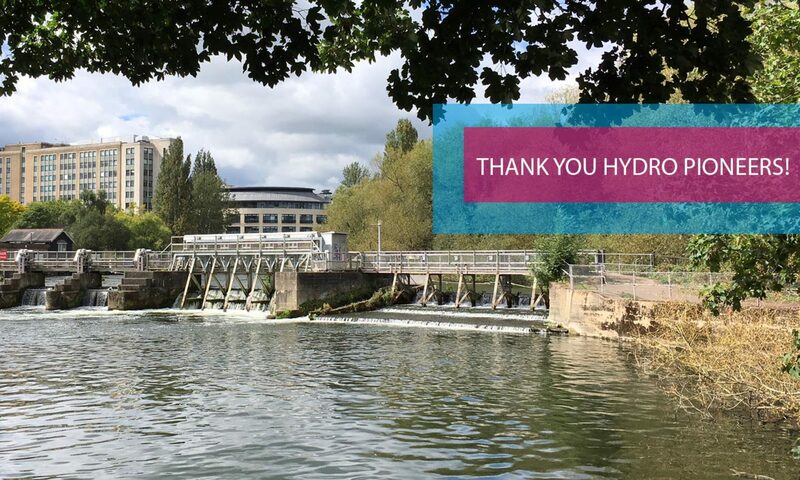 We’re excited to announce our Pioneer share offer for Reading Hydro CBS. This is an initial investment round to support the early stages, including outline design work to ensure the viability of the project. You can see how we did on Crowdfunder! We have got as far as we can supported by initial grants from the Reading Climate Change Partnership and the Department of Energy & Climate Change (now BEIS). All alongside countless hours from our wonderful volunteers. Now we need to move quickly to the next stages! The government is ending the Feed In Tariff for renewable energy at the end of March 2019. In order to secure this extra income, essential for the viability for the project, we must register our scheme with Ofgem before then. We are working to achieve all the necessary permissions. In parallel we are commissioning an Outline Design for the project by an experienced contractor. You can buy into our Pioneer Share Offer to kick start this project work. This will cover project permissions costs and the commissioning of the outline scheme design. After all this we will be able to do a full design for the project, make our Main Community Share Offer, and build the scheme. Without the money raised from this Pioneer Share Offer the project won’t happen for years. All Pioneer Share owners will be members with a vote in our Community Benefit Society, be eligible to have their investment repaid over time once the scheme is up and running, and gain other perks along the way. If the scheme cannot be built the Pioneer Shares will not be able to be paid back. Your money is at risk if the project fails; your support makes it more likely we will succeed.